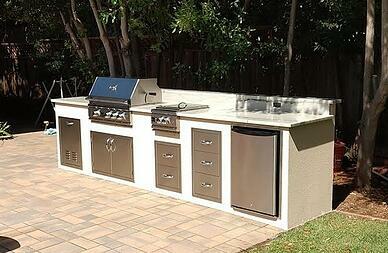 Do you dream of having an outdoor kitchen, but are afraid your backyard is too small? You can still have a beautiful and functional kitchenette in your small yard if you plan carefully! After that, pick only one or two other features that you must have. Can’t imagine not having a barbecue smoker or a working sink? Then prioritize those. If you’re on the fence about including a mini refrigerator or another item, leave it out and enjoy the extra space. Instead of planning a grand island in the middle of your yard, maximize your space by building your kitchenette against an existing border, such as a fence or the end of your patio. Chances are you don’t actually need to access your kitchenette from multiple angles, and you’ll appreciate the extra maneuvering room when you’re actually doing the work of cooking. That being said, make sure your grill is not too close to a wooden fence or an exterior wall of your home—you want to avoid fire hazards! To make the most of your limited space, make your outdoor kitchenette just about cooking and food prep. Don’t insist on a long counter with bar seating if you don’t have room for it, and don’t let a large patio table compete for kitchen space. Instead, improvise with portable chairs that can be set out on the deck or on the grass, and later stacked up and stored away. People probably won’t mind too much where they’re sitting if they have good company and a perfectly grilled hamburger to enjoy! Someone who designs outdoor kitchens for a living is likely to know several tricks and tips for reducing the footprint without sacrificing usability. A professional can help you figure out the most effective layout that will make the food preparation process flow smoothly, and help you avoid feeling cramped when cooking in your kitchenette. If you’re in the San Francisco Bay Area, the designers at Unlimited Outdoor Kitchen will be happy to take a look at your backyard space and give you a free estimate for your vision. We’ve been in the business for a long time and have helped families with backyards of all sizes get their dream kitchenettes—and we’d love for you to be next!